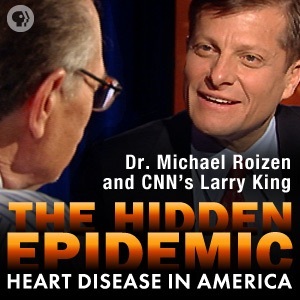 This eleven-part podcast series, a companion to PBS' Valentine's Day television special, The Hidden Epidemic: Heart Disease In America, features best-selling author, Dr. Michael F. Roizen, M.D. and Larry King of CNN's Larry King Live and the Larry King Cardiac Foundation, along with Julie Bain, Health Director at Reader's Digest magazine. In conversation with Julie Bain, Dr. Roizen explains ten different, easy steps you can take to a healthier heart. In the eleventh podcast, Larry King tells Dr. Roizen about his own narrow escape from a lethal heart attack and how that experience changed his life. This podcast series is part of Take One Step: a PBS Health Campaign, which launches with a ninety-minute television documentary accompanied by half-hour town hall meeting, hosted by Larry King and featuring some of the country's top medical and lifestyle experts, plus a website with online and downloadable resources at pbs.org/takeonestep. This Valentine's Day do your heart and loved ones a favor by tuning in to The Hidden Epidemic: Heart Disease in America, Wednesday, February 14, 2007 at 9 PM (check local listings). "The Hidden Epidemic: Heart Disease in America" is produced by WGBH Boston for PBS. Funding is provided by the Corporation for Public Broadcasting and public television viewers. If you enjoy this podcast, please consider becoming a member of your local public television station.